Did you know that whole wheat flour starts to loose nutrients after being milled, and the natural oils it contains start to become rancid if the flour is stored at room temperature? Whole wheat is an excellent source of vitamin E, which protects against heart disease, cancer and even helps to keep skin looking youthful. Each grain of wheat is protected by a layer of bran on the outside, and as long as it is kept dry and the bran is unbroken, wheat berries keep indefinitely without any loss of nutrients. However, as soon as wheat berries are cracked open, as in milling, their exposed natural oils begin to oxidize, causing them to become rancid and carcinogenic. When oils become rancid, they lose their nutritional benefits and instead become toxic to the body. Any available antioxidants, like vitamin E, are then used to neutralize the free radicals created by the rancid oils. If you are eating whole grain flour because of its health benefits, it is important to consider the freshness of the flour as well. Within 24 hours of being milled, whole wheat flour looses as much as 45% of its nutrients to oxidation. And in only 3 days, up to 90% of the nutrients are lost. In about the same amount of time it takes for milk to become sour at room temperature, the natural oils in whole wheat flour become rancid. Just think of what happens to natural flour that sits on a shelf at your grocery store for months before you buy it! The very best way to get the maximum nutrition from whole wheat flour is to buy whole grain wheat and mill it at home just before you bake with it. Any unused flour should be stored in the refrigerator or freezer. Freshly milled whole grain flour is sweet and nutty, and very mild flavored. I’ve been making bread for our family for over 13 years, but it was only 2 years ago that we bought a grain mill and switched from store bought flour to milling our own flour at home. The desire to feed our family the most nutrient dense diet possible was a big factor in our decision to invest in a grain mill, but what none of us realized is that the flavor of home ground wheat can hardly be compared to the sharp taste of wheat flour that has been sitting out on a shelf somewhere. It’s almost like using an entirely different product! When we first started milling our own grain, we immediately noticed a major difference in fresh vs. store bought flour. Our bread, pancakes and pie crusts were much tastier, and definitely more tender. We would never go back to using the store bought stuff! After we bought our grain mill, we began to experiment with different grains for different kinds of recipes. The only kind of whole wheat flour available at most grocery stores is made from hard red wheat, but there are many other varieties. We use hard red wheat, hard white wheat, and spelt for perfect, 100% whole wheat bread, and soft white wheat for light, fluffy pancakes, muffins, scones and flaky biscuits and pie crusts. Another reason we like to grind our own flour is that we can keep pails of whole grains on hand for use throughout the year, and we don’t need to run to the grocery store for more flour every week. This has the added benefit of security in knowing we are well provided for in case of any kind of natural or economic disaster. In an emergency, wheat can be made into bread or pancakes, or it can be sprouted to add the benefit of green vegetables to a survival diet. 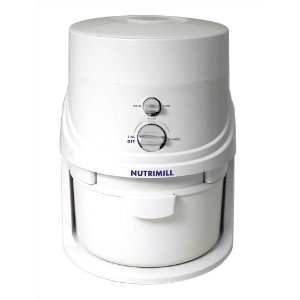 Click this link to take a closer look at our favorite grain mill, the Nutrimill.